← Rejection – Where Is Thy Sting? 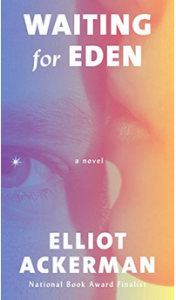 But out-of-the-ordinary has become the rule for the novels of Elliot Ackerman, author of the critically acclaimed debut Green on Blue, National Book Award finalist Dark at the Crossing, and now his latest, Eden, being released on September 25. As a journalist, Ackerman was based for a number of years in Istanbul, starting in 2013, where he covered the Syrian Civil War. Among other publications, his writing has appeared in The New Yorker, The Atlantic, The New Republic, and The New York Times Magazine, and his stories have been included in The Best American Short Stories. He is both a former White House Fellow and a Marine, and has served five tours of duty in Iraq and Afghanistan, where he received the Silver Star, the Bronze Star for Valor, and the Purple Heart. Those tours of duty fully inform his novels, which are often bleak and claustrophobic, and still utterly compelling. What may seem remarkable for a U.S. Marine-turned-author is the level of empathy he displays for his subjects. The narrator in Green on Blue is a young Afghani soldier, Aziz, while the protagonist in Dark at the Crossing, Haris, is a native Iraqi and naturalized American working as a translator with U.S. troops in Iraq. Now, in his latest, the narrator is a dead U.S. serviceman whose name we never learn. He is waiting for his best buddy, Eden Malcolm, “the most wounded man in the history of war,” to cross over to the other side and join him. But Eden, down to seventy pounds and no remaining limbs, improbably persists. His pregnant wife Mary does not leave his side for three years, even when her family and his beg her to let him go. She gives birth in the hospital’s maternity ward, and the baby spends her first years with them before finally going home with Mary’s mother. A common theme in Ackerman’s novels is a sense of there being no choices, of the main characters almost lacking free will. The narrator posits that this story is all about the choice that Mary makes, but it doesn’t appear that Mary sees or believes there is a choice to be made. Nonetheless, she has called out her husband and their friend for looking at things exactly the same way. Mary, though, is desperate to keep Eden from re-enlisting, and knows that he won’t go if she is pregnant. So she is doing her best to give him only one choice. Waiting for Eden is a spare but tightly-packed novel. Most gripping — and, for me personally, hardest to read — are the times when the narrator takes us inside of Eden’s head, when he is awake but unable to communicate. I considered Ackerman’s earlier books to have a sense of claustrophobia, but Eden — with its portrayal of a man being trapped entirely inside his brain — offers a glimpse directly into hell. One of Ackerman’s talents is his ability to ratchet up the tension in the smallest moments, when on the surface not much is happening, and he does that perhaps most expertly here. Each of the characters is waiting for something, even if they aren’t sure why. But at least they are waiting together.